Mobility and fitness begin to decline with age, leading to loss of strength and stability. 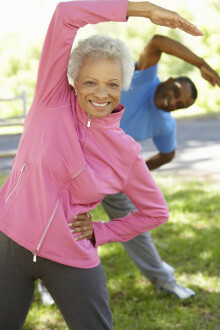 Researchers now believe any kind of exercise is beneficial, even in later years. What is physical fitness? It’s defined as a state of health necessary to exercise and complete daily activities without getting overly fatigued. Good fitness requires strong muscles, flexibility, and endurance. To stay fit, you need to improve your aerobic fitness and strength. Having strong core muscles—the muscles of the abdomen, back, and pelvis—help you stay upright and make it easier for you to be physically active. Core exercises for seniors strengthen these muscles without causing excess stress. Programs such as Pilates, tai chi, and stability ball training work core muscles in a safe, effective way. Specific abdominal exercises such as crunches and planks create a flatter, more toned stomach. Pilates is a workout program that specifically targets core muscles. Exercises can be done using special equipment, or with the body’s own weight as resistance. Pilates strengthens the abdominal muscles and improves overall strength and flexibility. It also incorporates breathing techniques. Signature Pilates exercises include “The Hundred,” which involves lying on the back, lifting the legs, and pressing down with straight arms for a count of 100. Diet is another important component to accompany mobility and fitness. To perform at your best physically, you need to eat a balanced diet, complete with fruits, vegetables, whole grains, low-fat dairy, and lean protein. People seeking to lose weight may try one or more different diet plans, from Weight Watchers to vegetarian. Core muscles stabilize segments of the body, act as a shock absorber for the whole body, maintain functional (working) posture, and allow for motions, such as flexion and rotation. Each muscle and muscle group has a specific role to play in terms of daily activities. The best one-size-fits-all class for flexibility is an aerobic exercise group class. The ultimate goal is aerobic (cardiovascular) fitness, but instructors and their students have to go through warm-up and flexibility exercises before getting to the aerobic component. Some people are reluctant to begin an exercise because they think sophisticated machines or expensive gym equipment are needed. Not so with core fitness. The core can be strengthened using body-weight exercises—using your own body as resistance —or easy-to-use balls, free weights, bands, and even chairs. We don’t hear the term “aerobic exercise” bandied about as often as we once did, but make no mistake: This type of activity remains the key to a healthy heart. Let’s look at the benefits of aerobic exercise. First, what exactly is aerobic exercise?